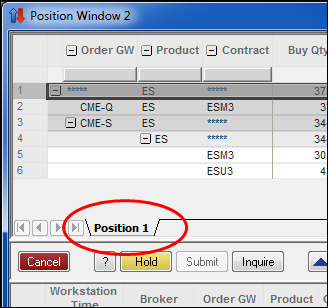 The top pane is the PositionPane provides a customizable view of positions, working orders, P/L, and available credit. The left side of the window contains plus and minus buttons allowing you to see a summary of trading activity by User Group. You can expand a User Group to see activity by Username, Exchange, Product, and Contract. Trading activity in the Position Pane can be summarized in different ways (e.g., by Account, Contract, Exchange, MGT, Market, or Source). By default, activity is grouped by User Group, then Username, Product, and then Contract. However, if you want to see the activity summarized in a different way, you can change the display by selecting Grouping… from the right-click Position Pane context menu. When setting Grouping options, you may enable (check) Static Position Rows. This functionality allows you to view Position Window information in the same order each day, regardless of whether any trading activity has been associated with a particular Summary position row. The Position Pane dynamically updates and displays data in the Static Position Row grouping when there is trading activity. For example, you can save a position row for every trader, even those traders without trading activity. When one of those traders trades, their data will display in the group level. You may choose to hide static rows by selecting Hide Row from the Position Pane right-click context menu. A right-click menu option called Unhide Rows is available to display previously hidden static rows. Levels beneath static rows dynamically display and sort based upon the criteria set for that level. Within each grouping level, is a Sort check box that allows you to sort within the grouping level. By default, the Sort checkbox is setting is enabled (checked) and the grid to the right displays the same field as the specified grouping. Clicking the drop-down arrow associated with the field displays a list of all of the Position Pane columns allowing you to select your desired sort parameters. Once OK is clicked, the Position Window is grouped and sorted based on the specified fields. If Static Row is checked, the position rows for that level are saved in the workspace. The Position Pane contains columns allowing you to dynamically view margin, credit, and available credit. You can also separate out spread trading. For example, selecting Buy Spread Qty, Sell Spread Qty, Wrk Buy Spread, and Wrk Sell Spread from the Column Configuration dialog box displays positions and working orders for each exchange-traded spread, the legs of those exchange-traded spreads, and summarized at the product level. Select which Position Pane columns display using Show/Hide Columns from the right-click context menu. The Position Window contains one tab when it is initially opened. Additional tabs can be added to create different views of the trading activity within a single workspace. The data displayed and filtered on each tab can be changed as you see fit. The tabs can be renamed and color-coded. The following figure shows the tab in the Position Pane.